This is the fallacy of jumping to fixed-points. In this post I want to discuss both the importance and power of local maxima, and the dangers of simply assuming that our system is at a local maximum. In his video, THUNK discusses a wide range of local maxima and contrasts them with the intended global maximum (or more desired local maxima). He first considers a Roomba vacuum cleaner that is trying to maximize the area that it cleans but gets stuck in the local maximum of his chair’s legs. And then he goes on to discuss similar cases in physics, chemisty, evolution, psychology, and culture. It is a wonderful set of examples and a nice illustration of the power of fixed-points. Evolution is a sort of hill-climbing algorithm. One that has identified local maxima of survival and replication. This is a common characterization of evolution. And it seems much less silly than the economist passing up $20. But it is still an example of the fallacy of jumping to fixed-points. My goal in this post is to convince you that THUNK describing evolution and the economist passing up $20 are actually using the same kind of argument. Sometimes this is a very useful argument, but sometimes it is just a starting point that without further elaboration becomes a fallacy. As regular readers of TheEGG know, I’ve been interested in fitness landscapes for many years. At their most basic, a fitness landscape is an almost unworkably vague idea: it is just a mapping from some description of organisms (usually a string corresponding to a genotype or phenotype) to fitness, alongside some notion of locality — i.e. some descriptions being closer to each other than to some other descriptions. Usually, fitness landscapes are studied over combinatorially large genotypic spaces on many loci, with locality coming form something like point mutations at each locus. These spaces are exponentially large in the number of loci. As such, no matter how rapidly next-generation sequencing and fitness assays expand, we will not be able to treat a fitness landscape as simply an array of numbers and measure each fitness. At least for any moderate or larger number of genes. The space is just too big. As such, we can’t consider an arbitrary mapping from genotypes to fitness. Instead, we need to consider compact representations. Ever since Julian Z. Xue first introduced me to it, my favorite compact representation has probably been the NK-model of fitness landscapes. In this post, I will rehearse the definition of what I’d call the classic NK-model. But I’ll then consider how the model would have been defined if it was originally proposed by a mathematician or computer scientists. I’ll call this the generalized NK-model and argue that it isn’t only mathematically more natural but also biologically more sensible. As you can tell from browsing the mathematical oncology posts on TheEGG, somatic evolution is now recognized as a central force in the initiation, progression, treatment, and management of cancer. This has opened a new front in the proverbial war on cancer: focusing on the ecology and evolutionary biology of cancer. On this new front, we are starting to deploy new kinds of mathematical machinery like fitness landscapes and evolutionary games. Recently, together with Peter Jeavons, I wrote a couple of thousand words on this new machinery for Russell Rockne’s upcoming mathematical oncology roadmap. Our central argument being — to continue the war metaphor — that with new machinery, we need new tactics. Biologist often aim for reductive explanations, and mathematical modelers have tended to encourage this tactic by searching for mechanistic models. This is important work. But we also need to consider other tactics. Most notable, we need to look at the role that abstraction — both theoretical and empirical abstraction — can play in modeling and thinking about cancer. The easiest way to share my vision for how we should approach this new tactic would be to throw a preprint up on BioRxiv or to wait for Rockne’s road map to eventually see print. Unfortunately, BioRxiv has a policy against views-like articles — as I was surprised to discover. And I am too impatient to wait for the eventual giant roadmap article. Hence, I want to share some central parts in this blog post. This is basically an edited and slightly more focused version of our roadmap. Since, so far, game theory models have had more direct impact in oncology than fitness landscapes, I’ve focused this post exclusively on games. As we leave 2018, the Theory, Evolution, and Games Group Blog enters its 9th calendar year. This past year started out slowly with only 4 posts in the first 5 months. However, after May 31st, I managed to maintain a regular posting schedule. This is the 32nd calendar week in a row with at least one new blog post released. I am very happy about this regularity. Let’s see if I can maintain it throughout 2019. A total of 38 posts appeared on TheEGG last year. This is the 3rd most prolific year after the 47 in 2014 and 88 in 2013. One of those being a review of the 12 posts of 2017 (the least prolific year for TheEGG). But the other 37 posts are too much to cover in one review. Thus, in this catalogue, I’ll focus on cancer and fitness landscapes. Next week, I’ll deal with the more philosophical content from the last year. There is often interest among the public and in the media about evolution and its effects for contemporary humans. In this context, some argue that humans have stopped evolving, including persons who have a good degree of influence over the public opinion. Famous BBC Natural History Unit broadcaster David Attenborough, for example, argued a few years ago in an interview that humans are the only species who “put halt to natural selection of its own free will”. The first time I read this, I thought that it seemed plausible. The advances in medicine that we made in the last two centuries mean that almost all babies can reach adulthood and have children of their own, which appears to cancel natural selection. However, after more careful thought, I realized that these sort of arguments for the ‘end of evolution’ could not be true. Upon more reflection, there just seem to be better arguments for open-ended evolution. One way of seeing that we’re still evolving is by observing that we actually created a new environment, with very different struggles than the ones that we encountered in the past. This is what Adam Benton (2013) suggests in his discussion of Attenborough. Living in cities with millions of people is very different from having to survive in a prehistoric jungle, so evolutionary pressures have shifted in this new environment. Success and fitness are measured differently. The continuing pace of changes and evolution in various fields such as technology, medicine, sciences is a clear example that humans continue to evolve. Even from a physical point of view, research shows that we are now becoming taller, after the effects of the last ice age faded out (Yang et al., 2010), while our brain seems to get smaller, for various reasons with the most amusing being that we don’t need that much “central heating”. Take that Aristotle! Furthermore, the shape of our teeth and jaws changed as we changed our diet, with different populations having a different structure based on the local diet (von Cramon-Taubadel, 2011). But we don’t even need to resort to dynamically changing selection pressures. We can argue that evolution is ongoing even in a static environment. More importantly, we can make this argument in the laboratory. Although we do have to switch from humans to a more prolific species. A good example of this would be Richard Lenski’s long-term E-coli evolution experiment (Lenski et al., 1991) which shows that evolution is still ongoing after 50000 generations in the E-coli bacteria (Wiser et al., 2013). The fitness of the E. coli keeps increasing! This certainly seems like open-ended evolution. But how do we make theoretical sense of these experimental observations? Artem Kaznatcheev (2018) has one suggestion: ‘hard’ landscapes due to the constraints of computational complexity. He suggests that evolution can be seen as a computational problem, in which the organisms try to maximize their fitness over successive generations. This problem would still be constrained by the theory of computational complexity, which tells us that some problems are too hard to be solved in a reasonable amount of time. Unfortunately, Artem’s work is far too theoretical. This is where my third-year project at the University of Oxford comes in. I will be working together with Artem on actually simulating open-ended evolution on specific examples of hard fitness landscapes that arise from valued constraint satisfaction problems (VCSPs). Why VCSPs? They are an elegant generalization of the weighted 2SAT problem that Artem used in his work on hard landscapes. I’ll use this blog post to introduce CSPs, VCSPs, explain how they generalize weighted 2 SAT (and thus the NK fitness landscape model), and provide a way to translate between the language of computer science and that of biology. Last week, I expanded on Rob Noble’s warning about the different meanings of de novo resistance with a general discussion on the meaning of resistance in a biological vs clinical setting. In that post, I suggested that clinicians are much more comfortable than biologists with resistance without cost, or more radically: with negative cost. But I made no argument — especially no reductive argument that could potentially sway a biologist — about why we should entertain the clinician’s perspective. I want to provide a sketch for such an argument in this post. In particular, I want to present a theoretical and extremely simple fitness landscape on which a hypothetical tumour might be evolving. The key feature of this landscape is a low local peak blocking the path to a higher local peak — a (partial) ultimate constraint on evolution. I will then consider two imaginary treatments on this landscape, one that I find to be more similar to a global chemotherapy and one that is meant to capture the essence of a targetted therapy. In the process, I will get to introduce the idea of therapy transformations to a landscape — something to address the tendency of people treating treatment fitness landscapes as completely unrelated to untreated fitness landscapes. Of course, these hypothetical landscapes are chosen as toy models where we can have resistance emerge with a ‘negative’ cost. It is an empirical question to determine if any of this heuristic capture some important feature of real cancer landscapes. But we won’t know until we start looking. Nice analysis Artem! If we think of the fitness as a function of genes, interactions between two genes, and interactions between three genes and so on, your analysis using epistasis takes into account only the interactions (second order and more). The presence or absence of the genes themselves (first order) can change the landscape itself, though. Evolution might be able to play the game of standing still as the landscape around it changes until a species is “stabilized” by finding itself in a peak. The question is would traversing these time-dependent landscapes for optima is still uncomputable? And although I responded to his comment in the bioRxiv Disqus thread, it seems that comments are version locked and so you cannot see Hema’s comment anymore on the newest version. As such, I wanted to share my response on the blog and expand a bit on it. Mostly this will be an incomplete argument for why biologists should care about worst-case analysis. I’ll have to expand on it more in the future. Tonight, I am passing through Toulouse on my way to Montpellier for the 2nd Joint Congress on Evolutionary Biology. If you are also attending then find me on 21 August at poster P-0861 on level 2 to learn about computational complexity as an ultimate constraint on evolution. During the flight over, I was thinking about fitness landscapes. Unsurprising — I know. A particular point that I try to make about fitness landscapes in my work is that we should imagine them as mazes, not as mountain ranges. 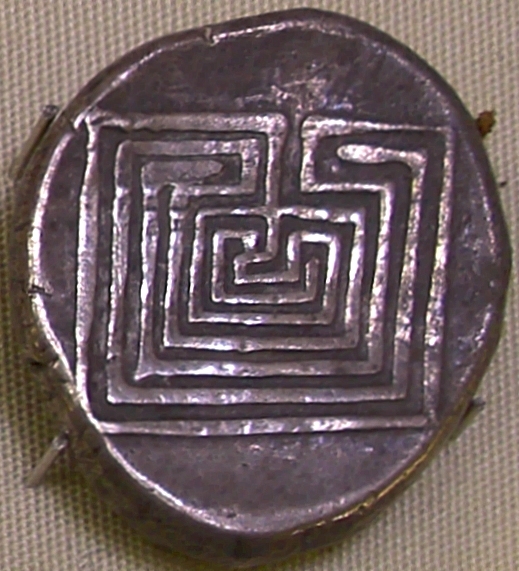 Recently, Raoul Wadham reminded me that I haven’t written about the maze metaphor on the blog. So now is a good time to write on labyrinths. On page 356 of The roles of mutation, inbreeding, crossbreeding, and selection in evolution, Sewall Wright tells us that evolution proceeds on a fitness landscape. We are to imagine these landscapes as mountain ranges, and natural selection as a walk uphill. What follows — signed by Dr. Jorge Lednem Beagle, former navigator of the fitness maze — throws unexpected light on this perspective. The first two pages of the record are missing. For a mathematician — like John D. Cook, for example — objectives and constraints are duals of each other. But sometimes the objectives are easier to see than the constraints. This is certainly the case for evolution. Here, most students would point you to fitness as the objective to be maximized. And at least at a heuristic level — under a sufficiently nuanced definition of fitness — biologists would agree. So let’s take the objective as known. This leaves us with the harder to see constraints. Ever since the microscope, biologists have been expert at studying the hard to see. So, of course — as an editor at Proceedings of the Royal Society: B reminded me — they have looked at constraints on evolution. In particular, departures from an expected evolutionary equilibrium is where biologists see constraints on evolution. An evolutionary constraint is anything that prevents a population from being at a fitness peak. In this post, I want to follow a bit of a winding path. First, I’ll appeal to Mayr’s ultimate-proximate distinction as a motivation for why biologists care about evolutionary constraints. Second, I’ll introduce the constraints on evolution that have been already studied, and argue that these are mostly proximal constraints. Third, I’ll introduce the notion of ultimate constraints and interpret my work on the computational complexity of evolutionary equilibria as an ultimate constraint. Finally, I’ll point at a particularly important consequence of the computational constraint of evolution: the possibility of open-ended evolution. In a way, this post can be read as an overview of the change in focus between Kaznatcheev (2013) and (2018).